The burp cloth - a diaper bag staple. A new parent will likely be within reach of one of these 24 hrs a day for a good 6 months. It might seem weird that one would develop strong feelings regarding the effectiveness of burp cloths, but it happens. I subconsciously ranked mine on a scale from 'just moves the mess around' to 'I love you, burp cloth'. I guess I spent a lot of time thinking about baby spit up. 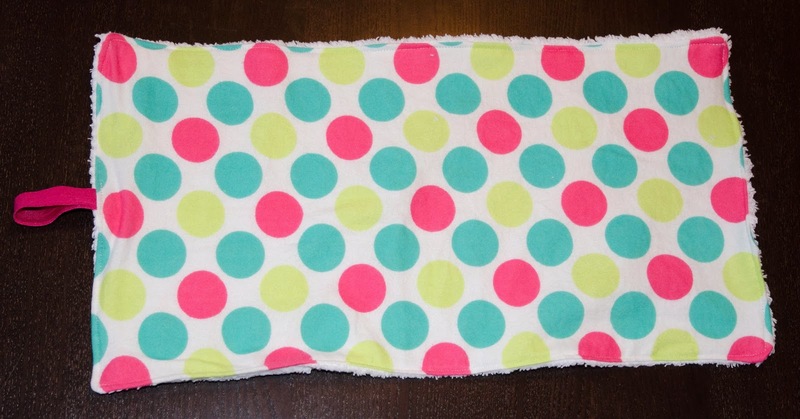 For some reason, while I was pregnant I was determined to sew my own burp cloth. This didn't necessarily make sense as I had several, but I'll chalk it up to 'nesting' which is often illogical (though mention that little fact to a pregnant lady at your own risk). Anyway, I finally got around to it two weeks into my maternity leave. It was a quick project, which is a good thing because I went into labor a few hours later. Surprise! In our tiny CA house this meant that my sewing machine and supplies were in the middle of the living room when we got home from the hospital. Oops. Despite the less than ideal timing, I'm still really glad I made this burp cloth. It has turned out to be my absolute favorite and now I make them for all my pregnant friends. These and my bunny ear teethers, which works great because they use the same fabric! So what makes this burp cloth 'better'? This burp cloth obviously has all the basics - absorbent, soft, washable. A few bonus features in the design have me reaching for this cloth as my favorite. First, it is more narrow than a lot of burp cloths out there - particularly those made from pre fold cloth diapers. My shoulders were just not wide enough for the larger cloths to stay put without a lot of hassle. I also found the bigger cloths took up too much space in my diaper bag when a smaller cloth would do the job just fine. 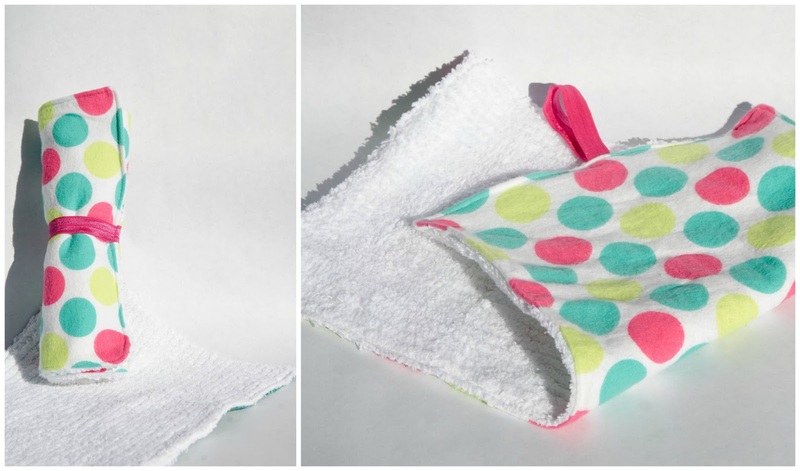 The elastic strap helps keep them folded up, which both keeps your diaper bag neat and keeps a 'used' cloth from getting the rest of the contents of your diaper bag gross. 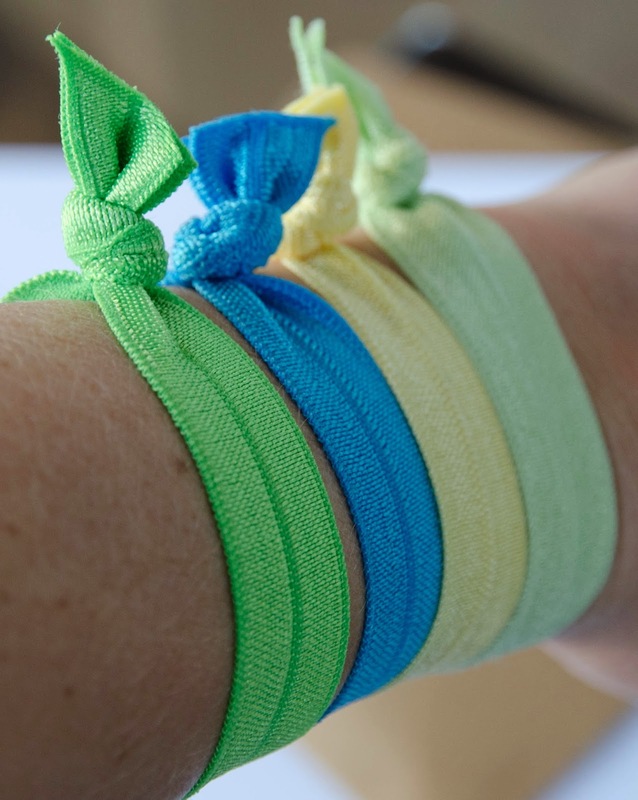 The elastic strap has another perk: it can be used to hang the cloth from a plastic ring, a paci clip, or even your wrist. So you can attach it to a stroller or yourself to prevent it from falling on the floor (particularly helpful on an airplane). And while you are at it, order yourself some extra elastic and make some hair ties - you know the ones that Anthropologie sells in a 5 pack for $12 that can be made for about 50 cents. I'm just full of good DIY advice today. Chenille , 9.5" x 17"
Prewash fabrics. Cut rectangles of flannel and chenille (Dimensions 9.5" x 17") and pin them right sides together. (I'm a huge fan of the Chenille which does a great job soaking up a mess, but regular terry cloth can be used as well). Cut approximately 6" of the fold over elastic and fold it in half with the shiny sides together. Insert the folded elastic between the flannel and chenille centered on one of the short sides of the rectangle. 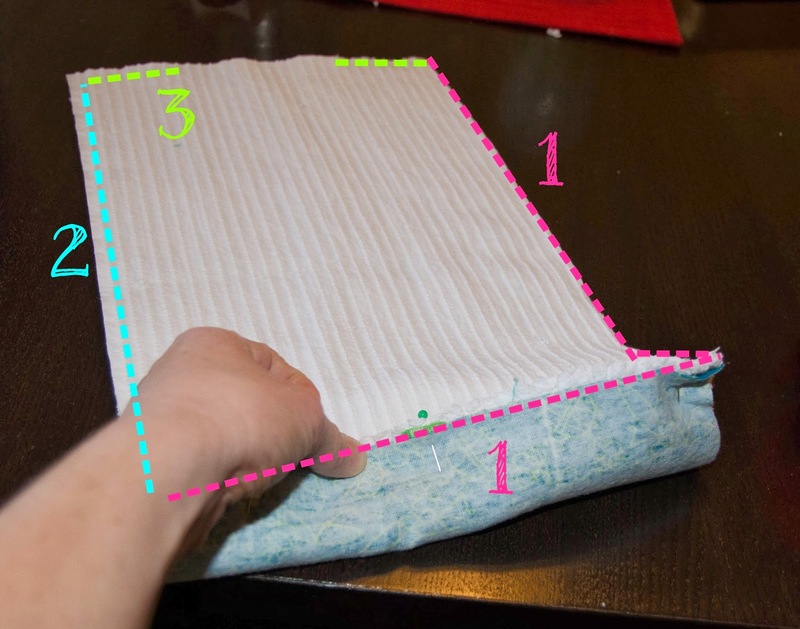 Place the fold of the elastic toward the inside of the burp cloth and the cut end at the outer edge. Pin in place. After a bit of trial, and lots of error, I discovered that the stretch present in some of the flannel pieces was causing a bit of 'skewing' during sewing. To minimize the effect of the stretch, I sew around the edge of the burp cloth in a very specific order. It takes a tiny bit longer than just sewing continuously around the rectangle, but it is worth it. (1) First, using a 1/4" seam allowance, I sew across the short side of burp cloth with the pinned elastic (while sewing over the elastic, I usually go backward and forward a few times to make sure the seam is very strong). Lifting the foot, I turn the corner, and continue to sew down one long side. Backstitch and cut the thread. (2) I then reposition the needle at the original starting point, but sew down the second long side of the rectangle in the same direction as the first long side was sewn. This will allow the flannel to stretch down evenly on both sides. At the bottom of the second long side I backstitch and cut the thread. At this point, it is important to make sure the chenille and flannel are smooth and not wrinkled (though the flannel may extend beyond the chenille end at this point). (3) With the 'shorter' fabric on top (often the chenille) and leaving a 1/4" seam allowance from the edge of the shorter fabric, sew from one corner toward the center of the remaining open side approximately 3" inches. Backstitch and cut thread. Then repeat this from the other corner toward the center. Be sure to leave approximately 3" open in the center of the short side of the rectangle. This gap will be used to turn the fabric right side out. Use fabric scissors to clip the four corners, careful not to clip the seam. This will allow for cleaner corners. You can also trim the flannel if it stretches far beyond the chenille on any side. Now turn the burp cloth right side out and use a point turner to push the corners to a point from inside the burp cloth. At the open section, fold the fabric in to match the seam allowance and pin closed. Top stitch approximately 1/8" around the rectangle to finish the burp cloth and close the gap. Again, you can sew back and forth where the elastic is joined to the burp cloth to reinforce. Repeat for as many pregnant friends as you have. I, for one, currently have a lot. Good thing these are so quick!